I left my rural hometown of Stevinson, CA (population: 262) to come to Stanford as a wide-eyed freshman in 1985. That tour passed through SLE, the LSJUMB, a half-dozen changes in my major, and I emerged with a Mathematical Sciences degree. A few years out in the “real world” were enough to send me running back for grad school in computer science and I segued into my current position as a lecturer in 1992 without setting foot off campus again. I teach courses in the undergrad systems curriculum, including programming methodology and abstractions, language paradigms, compilers, and object-oriented design and development, but I especially enjoy working with the section leaders in the CS106 courses. 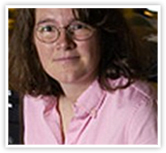 I have been the advisor to the Stanford SWE and ACM-W chapters and recently served on the Computer Science Advanced Placement development committee. This course is the natural successor to Programming Methodology and covers such advanced programming topics as recursion, algorithmic analysis, and data abstraction using the C++ programming language, which is similar to both C and Java. If you’ve taken the Computer Science AP exam and done well (scored 4 or 5) or earned a good grade in a college course, Programming Abstractions may be an appropriate course for you to start with, but often Programming Abstractions (Accelerated) is a better choice. Programming Abstractions assumes that you already have familiarity with good programming style and software engineering issues (at the level of Programming Methodology), and that you can use this understanding as a foundation on which to tackle new topics in programming and data abstraction. Prerequisites: Solid performance in Programming Methodology and readiness to move on to advanced programming topics. A comparable introductory programming course (including high school AP courses) is often a reasonable substitute for our Programming Methodology.